In this article, I’ll compare the different ukulele sizes and discuss which sizes I feel are best for beginners. You might also like my posts on the best ukuleles for beginners and how to buy a beginner ukulele. The four most common ukulele sizes are soprano, concert, tenor, and baritone. There isn’t a universal standard for ukulele sizes. Most ukes will be close to the figures given above, but the actual measurements can vary slightly depending on the manufacturer. Soprano, concert, and tenor size ukuleles are all tuned the same way: G-C-E-A. This is known as standard tuning. Baritone ukuleles have a different tuning: D-G-B-E. While this tuning has a musical relationship to the other sizes (it’s five half steps lower) it’s still in its own category. Most ukulele music is written for a soprano, concert, or tenor size uke. For this reason, I usually recommend beginners stick with one of these three sizes and avoid starting out on a baritone. As the body of an acoustic instrument gets bigger, its tone will have more volume, bass, and overall resonance. This is why concert and tenor ukuleles tend to sound bigger and fuller than a similar soprano uke. Many players prefer the warmer, fuller tone of these larger sizes and feel that their fuller voice gives them more versatility than sopranos. On the other hand, a lot of people love the traditional sound of a soprano ukulele and find the bright, tinkly tone endearing. There’s no right or wrong here–it’s really just a matter of personal preference. Some people find concert and tenor ukuleles easier to play than soprano ukuleles. 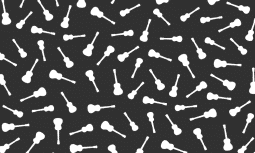 This has to do with scale length, which is the distance from the nut to the saddle. You can also think of it as the section of the strings that vibrates when you play. The scale length determines how far apart the frets are on the fingerboard. Frets are the thin metals bars in the fingerboard of a ukulele. Soprano ukes have a very short scale, so the frets are fairly close together. 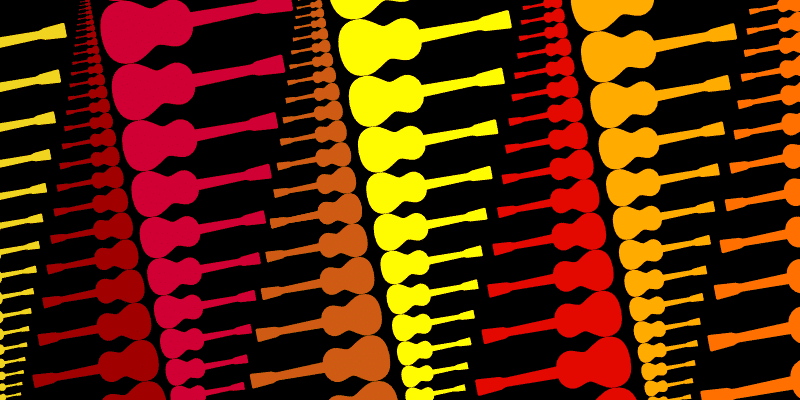 Concert and tenor ukes have longer scales, so the frets are spaced further apart. A short scale isn’t necessarily a bad thing, but it does mean there’s less room to maneuver on the fretboard. Some players with large hands or thick fingers might find soprano ukuleles a little harder to play than a concert or tenor. Soprano ukuleles are typically the most affordable instruments in the ukulele family, which can make them a good choice for players on a budget. ​The price difference will vary depending on the brand and model, but in most cases a soprano ukulele will be 10% to 25% cheaper than the next size up (concert). There are lots of excellent soprano ukuleles on the market, but the majority of poor quality ukuleles also tend to be sopranos. I know it’s tempting to buy one of those $20 soprano ukes on Amazon, but it’s hard to find good quality at that price range. To learn more, check out my article on ukulele prices. I don’t think there’s a single “best” size for beginning uke players–the most important thing is to get a good quality instrument and play it as much as you can! However, I usually try to nudge people toward a concert or tenor size. I think they’re a little more comfortable to play because of the longer scale, and I find that many people prefer the warmer, richer tone of concert or tenor ukulele. Of course, there’s absolutely nothing wrong with starting out on a soprano. Lots of people learn the basics on an inexpensive soprano and move up to a concert or tenor as they progress. There are more great beginner ukes on the market now than ever before–way too many to cover in this article! But here’s a quick selection of good beginner models to consider for your first ukulele. Why Are There Different Sizes? The very first ukuleles were mostly soprano sized. This is why it’s sometimes referred to as a standard size. The ukulele’s popularity grew over time, and concert and tenor ukulele sizes were introduced in the 1920s to meet players’ demands for bigger, fuller-sounding instruments. The baritone ukulele appeared around the 1950s. Depending on who’s telling the story, it was designed to be either a big ukulele or a small guitar. Soprano, concert, tenor, and baritone are by far the most popular ukulele sizes, but there are a few more sizes out there. Pineapple ukuleles have a distinct oval body shape that looks like a pineapple. They have a similar scale and body length as a soprano, but some manufacturers make also build concert and tenor size ukes in a pineapple shape. The pineapple ukulele size was designed and patented by Samuel K. Kamaka (of Kamaka Ukuleles) in 1928. Some manufacturers build ukuleles that are even smaller than a standard soprano. These tiny ukes are often categorized as sopranino or sopranissimo. 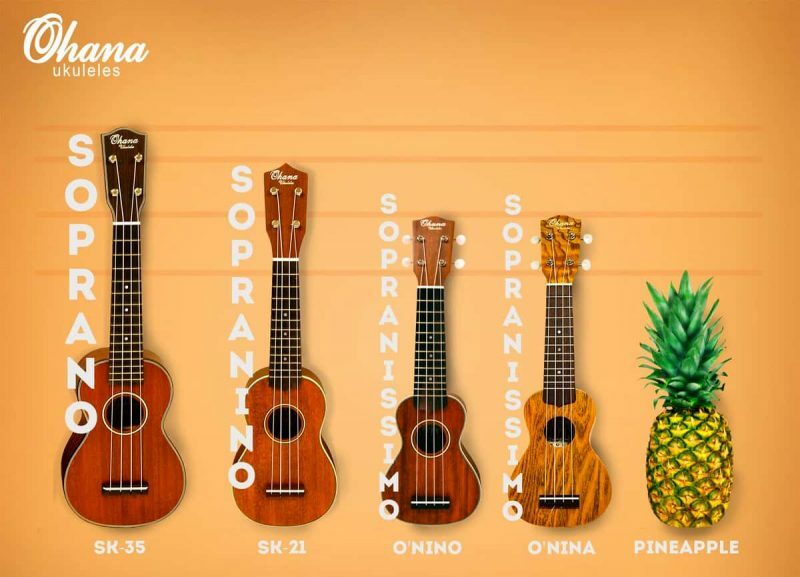 I couldn’t quite pin don standardized measurements for these smaller sizes, but the Ohana SK-21 sopranino has a total length of 19″, and their sopranissimo O’Nino ukulele is only 17″ long–that’s 4″ shorter than a regular soprano ukulele!